Most of us have had an experience of our car seemingly deciding not to start on us. For many people, this is a huge disruption, grounding you on the spot until you’re able to call someone out to fix it. For those with a automotive battery charger, however, that’s not the case. Keeping a battery charger in the home or somewhere in the car ensures that you can always get on the road. With that in mind, we’re going to look at how to choose the best car battery charger and why it matters. If you want to reduce your chances of a dead battery stopping you in your tracks, then this is an essential piece of equipment for just about any driver. What’s more, there are more advanced battery chargers out there that can give you more than a dose of juice when you need it. Modern car battery chargers can even condition and maintain your battery so that its overall longevity is improved. When you simply want to make sure you always have some charge in the batteries or you want to improve their overall cost-effectiveness, choosing the right charger is important. But what, exactly, makes the right car battery charger? Here, we’re going to look at some of the features that can ensure more convenience, the best performance, charge efficiency, and even improved car battery maintenance. 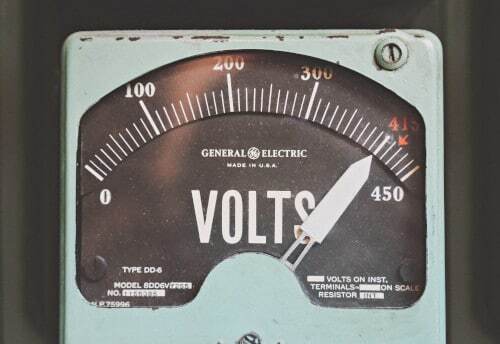 Voltage: This is the measure of electric power provided by the charger. Matching your car’s battery to the charger voltage is important and, in most cases, that lies at 12V. Other chargers can work with it. Multifunctional chargers that provide 6V of power also work with other batteries such as jet ski batteries but are slightly less efficient. Amperage: This is how much current the charger can supply at any one given time, and often dictates how quickly your charge helps your battery get its full charge back, though fast charging can also impact the battery’s longevity. Most chargers come with multiple amperage settings and auto settings to find the ideal rate without your intervention. Safety features: To avoid giving yourself a shock or overcharging the battery, safety features like auto voltage/amperage detection, reverse polarity features and spark-resistant clamps are important. Extras: A good car battery charger kit can come with extras like effectively long jump cables, battery diagnostic tools, trick charging, a maintenance mode and jumpstart features. With that out of the way, it’s time to look at some of the best car battery chargers on the market. This charger comes with both 12V and 24V with a 15A supply and an automated charge mode to help ensure the most efficient and effective charge time possible. Although one of the most expensive chargers featured here, it has some specific advantages worth noting. NOCO is a well-trusted brand and that’s not just due to their longevity and resilience. With a small, compact design, it’s easy to transport, use, and store in the boot or the garage. Heavy duty battery clamps are an example of solid, reliable design while the quick-connect and disconnect plugs make the task of charging the battery much more efficient. 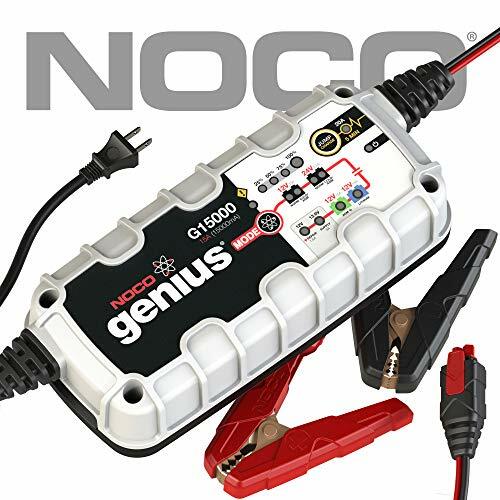 The battery maintenance functions of the NOCO Genius G15000 charger are well worth lauding as well. Though charging dry batteries can take very long on the slow setting, up to 14 hours, it can help restore the battery to near-peak efficiency. The smart charge function will automatically adjust the charge rate, so leaving it on for too long and the risk of overcharging isn’t a concern and, either. Good spark proof technology and reverse battery protection make it an overall effective, efficient, and safe tool to use that’s relatively simple for even the most automotive illiterate drivers. A powerful, professional grade battery charger and battery maintenance tool designed to recharge all types of batteries rapidly in workshops, garages or those you simply want the best. Perfect for keeping your vehicles fully-charged and maintained during year-round battery maintenance or long-term storage for improved performance and longevity. Works with all types of 12-volt and 24-volt lead-acid batteries, including Wet, Gel, and AGM, or any common automotive, deep-cycle, marine, or maintenance-free battery. Keep your battery fully charged without worry or overcharge. Simply plug-in and let our advanced charging technology automatically monitor and maintain your battery. Use our advanced Repair Mode to reverse the damaging effects when batteries are left uncharged for extended periods to improve battery performance and longevity. Selling for slightly higher than the NOCO Genius G15000, depending on where you find it, this is one of the most powerful car chargers on the market, able to deliver 1,700 peaks of jump-starting power. Beyond charging the battery, this means that it can bring engines back to life in even the coldest of conditions. It has similar charge restoring power to the NOCO Genius but is even more time-efficient when it comes to bringing a totally dead battery back to full charge. It’s also an efficient tool to use, as well. Especially light-weight and compact, it’s much easier to transport and store, while the thick 46-inch jumper cables mean that you’re not going to have to stretch too far to get some effective use out of it. With no power switch function, it’s important that the cables are stored correctly and kept separate to avoid sparks, so it does lose a few points for lacking the right safety functions there. Similarly, there’s no reverse polarity detection, so connection errors are a distinct possibility. For that reason, always make sure you’re connecting the right jumper cable to the right terminal. That said, the cables and clamps are spark-resistant with thick insulation, so they are reliable and long-lasting, provided you take care of them. 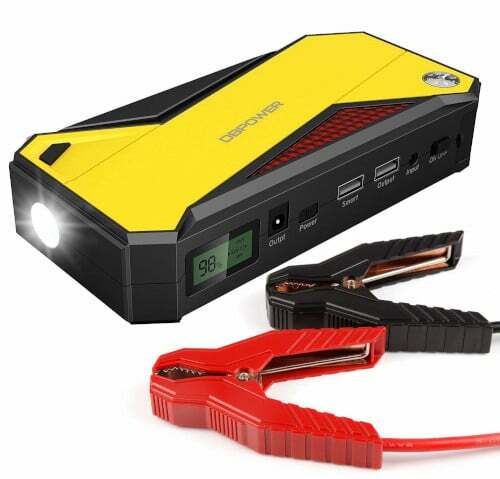 With up to 1000 Amp power supply, this 12V jump starter and charger isn’t quite as powerful as the Clore Automotive Jump-N-Carry, but that doesn’t mean that it doesn’t have its own advantages. As a 12V trickle charger, it’s much more versatile, able to charge a wide range of vehicles even if it might not be quite as efficient at charging your car. What’s more, the excellent NOCO standards for safety are all here, with reverse polarity detection and spark resistance as standard. As a safety feature, it comes with a strobe light function so that if you’re stuck on the side of the road, you can make sure other drivers are well alerted to your presence. One extra that’s particularly nice is the USB port, which allows you to charge smartphones, laptops, and other digital devices by simply using it as a charging dock. It’s a decent price, less expensive on average than the other two reviewed so far, but if you’re willing to pay more, you can get the same charger with even more Amperage, though 1000 might be all that you really need. Sharing much the same design as the Genius G15000, it’s just as easy to carry, store, and use, as well. Top rated jump starter on Amazon and travel blogs. Start dead batteries with a compact, yet powerful lithium jump starter rated at 1,000 Amps - up to 20 jump starts on a single charge. Connect to any battery safely with our ultra-safe, mistake-proof design featuring spark-proof technology and reverse polarity protection. An integrated LED flashlight with seven light modes, including low, medium, high, flashing, strobe and emergency SOS; plus 6-hours of continuous run time. Recharge smartphones, tablets, and other USB devices when you need them most; plus, recharge from any powered USB port. 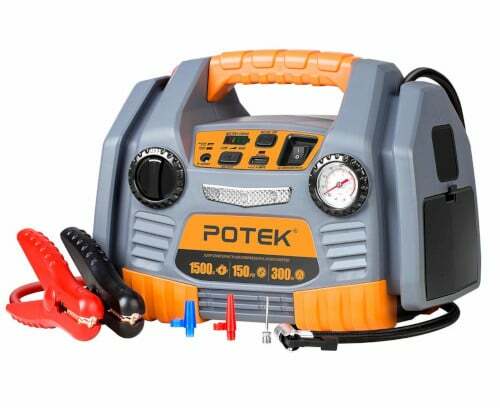 With serious power that’s nearly on the level of the Clore Automotive Jump-N-Carry, the POTEK Portable Power source has some significant jump-starting capabilities, but it’s a much more versatile device than it lets on. This device can power up not only the car and other vehicles thanks to trickle charge technology but is even designed to be used with home appliances up to 115-volt appliances thanks to its AC and USB ports. With an instant amperage of 750, and a peak of 1500, it can help you get your engine started in almost all conditions. The versatility doesn’t stop there, however, as it comes with an air compressor and air pressure gauge that can be used to deliver compressed air to flat tires, though it is somewhat noisy. Though it has no reverse polarity detection, meaning you should be careful which ends you connect the cables to, it does have several electrical safety features, including spark prevention, that makes using it relatively foolproof. Though slightly heavier than other portable chargers mentioned here, it’s rugged, solid design and the sheer versatility of it make it a great emergency multi-use tool that’s especially good for those who enjoy taking their vehicle for outdoor adventures such as camping. 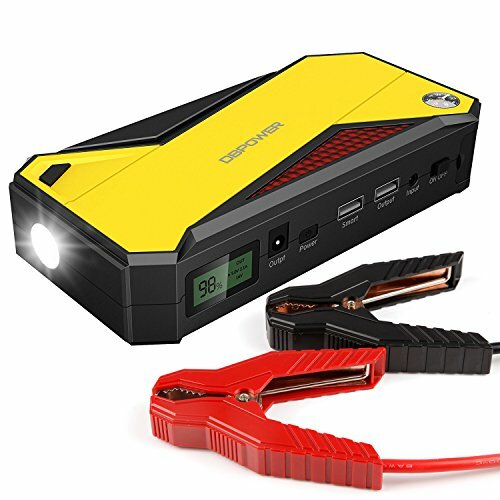 [HIGH PERFORMANCE] POTEK 1500 Peak/750 Instant Amps Car Jump Starter,equipped with 18AH lead acid battery, an emergency life saver when you are out,perfect for long driving, camping, biking. [PORTABLE POWER ON THE GO]With the two AC charging ports and USB port,you can not only charge your iphone,kindle but also charge your TV,led light and other 110volt appliance under 300watt.what's more,you can charge any 12V appliance like inverter, vaccum or mini fridge with the 12 volt power outlet sockets. [TWO WAYS FOR CHARGING]Equipped with 12 Volt Battery,not only can charge with AC adapter at home but also can charge it with DC adapter in your car. Despite being the lightest and easiest to both use and transport, the DBPOWER 600A Portable Charger is also one of the sturdiest and best-designed tools we’ve looked at. The low price, compared to the other entries, makes a little more sense when looking at its peak amperage of 600, which means it may have trouble starting your engine in bad weather conditions, but it’s still an effective and efficient charger. Easily stored in the glovebox, it has smart charging capability that can both quickly charge a battery in good health but also bring a truly dead battery back to life over a longer time. With good electrical protection and an extremely lightweight, convenient design, it justifies its lower price, but the jumper cables aren’t quite as strong as in the other battery chargers. 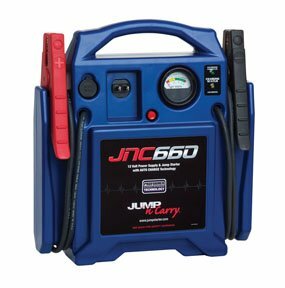 POWERFUL & COMPACT: Jump start your vehicle (up to 6.5L gas or 5.2L diesel engine) up to 20 times with 600 amps of peak current and heavy duty clamps and cables. Compact enough to store in your glovebox. SMART CHARGING PORT: With 18000mAh capacity and smart USB port, it can full charge your laptops (include 8 in 1 laptop adapters in the package), smartphones, tablets, and other devices at the fastest speed possible. PROTECTION: The high quality and spray gold intelligent jumper clamps has over current protection, short circuit protection, overload protection, over-voltage protection, over-charge protection. LCD SCREEN & COMPASS: The new-added LCD screen can exactly show the remaining power. The compass can help you find your way home when get lost in the wild. WHAT YOU GET: DBPOWER Jump Starter DJS50, intelligent jumper clamps, 12V wall charger, 12V car charger, use guide, our fan-favorite 3-year Warranty and friendly customer service. All of the car battery chargers mentioned here have their specific benefits and drawbacks. 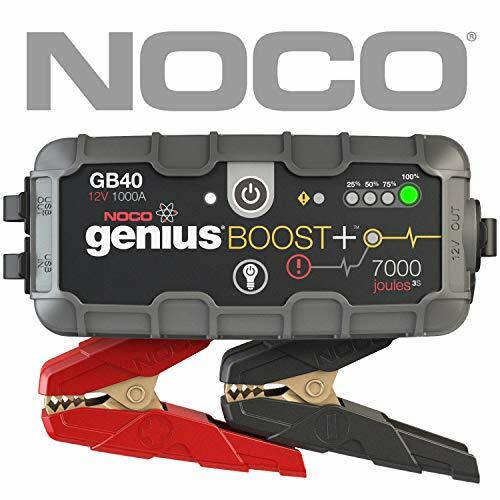 If we were to recommend one, the mix of power and versatility that the NOCO Genius Boost Plus GB40, paired with its excellent safety features, make it the easiest to recommend. 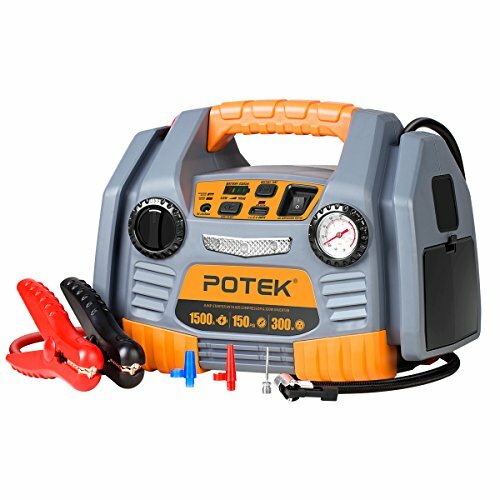 For those looking for a more versatile, multi-use tool that also includes a battery charger and jump starter, however, the POTEK Portable Charger is also well worth recommending. 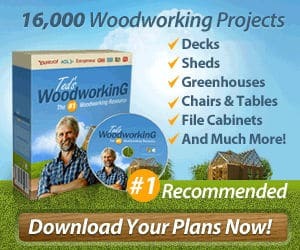 Copyright © 2018, TimberAndBattery.com. All rights reserved.